Hello? Did everyone have a great weekend? I certainly did. One of the nicest things about not working retail anymore is that I actually can have a real weekend like normal people. For years, every time some one said to me "Have a great weekend!" I cringed for I wanted to reply "I can't! I'll be working!" It was so hard to be at work when I knew everyone else was out having a good time. Especially holiday weekends. But now that I'm unemployed I can enjoy real weekends off with my husband. I'll have a great travel post coming soon about our winter hiking adventure. But for today's post, I'm playing Vicki's Challenge Flashback Friday again! This week Vicki challenged us to have the sentiment be the focal point of our card instead of an image. I must admit, as much as I like this look, I don't do it very often. When creating, my mind always sees pictures first, then words. A card without an image, seems kinda lost to me. But I've always been very visual, seeing images instead of just having thoughts. Perhaps that is why. In any case, I did make a card with the sentiment as the main focal point. My sentiment is from Papertrey Ink and is called 'Four of a Kind'. It was one of their 'free' sets that you received when you placed a large order. I wish I could give you more details on this card, but unfortunately I lost them all. I always write down the name of the image I used, the name of the paper, and the sketch, but I either forgot to write it down in this case, or I lost the piece of paper I wrote it on. So my apologies and if you recognize the sketch, let me know, and I'll edit my post accordingly. 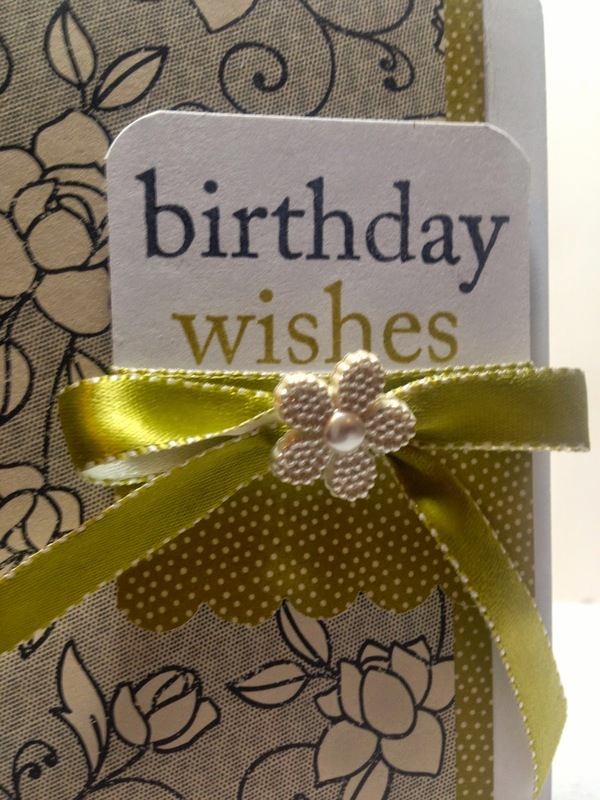 The corners of the sentiment panel and the card were rounded with a corner rounder. I used a scallop punch for the bottom of the sentiment panel. It is also mounted up on dimensionals to give it more visual impact. The little flower is actually a button purchased at a fabric and craft store. When you don't have to spend an hour coloring a line image, a card with only a sentiment can be a lot quicker and easier to make. However, because there is no image, you have to provide a lot of visual interest elsewhere. 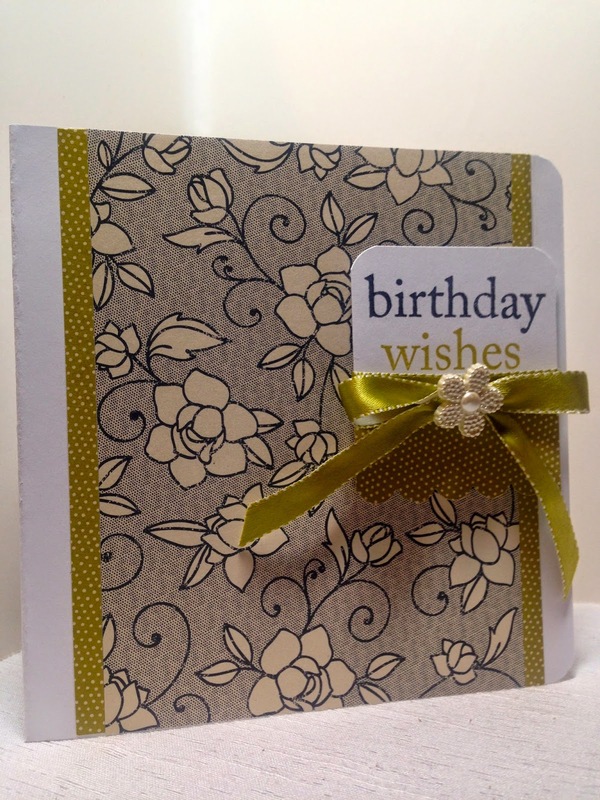 In this case, the sketch, papers, different ink colors, button, and bow all give the card a lot of creative details. Even the little extra touch of taking the time to round the corners is more interesting than just leaving them squared off. Beautiful fonts in your sentiment can sometimes be prettier than the images themselves too! If you have a stamp set with a intricate, or loud font, that may be all the interest you need for your card. In this case, the font in my sentiment was kinda plain, so I changed the ink colors, rounded the corners, and added more impact with the bow and button. So what about you? 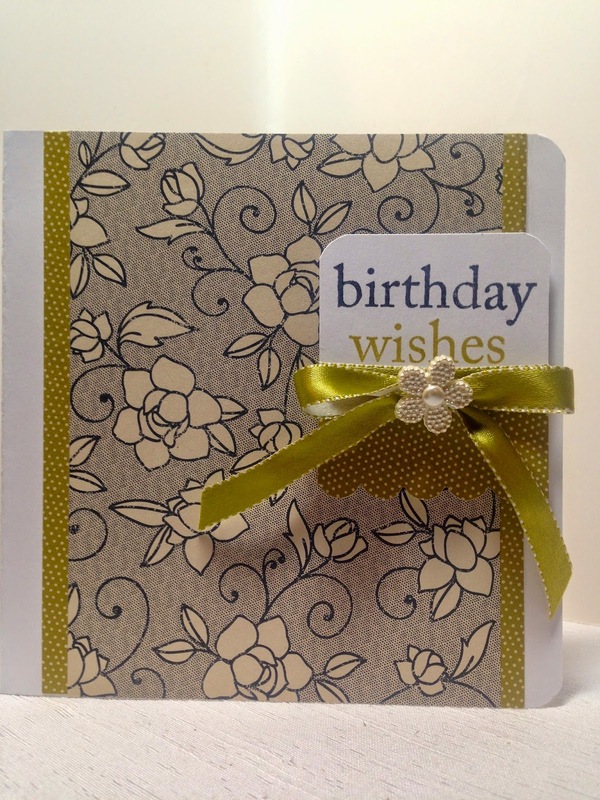 Do you make cards with sentiments only or do you always include an image? I'd love to hear from you. In addition to Flashback Friday, I am also linking up to Motivational Monday. Lovely card, Amy! The flower button is the perfect touch to this card! So very pretty! I am so glad you can have "real" weekend. My husband is also in the retail business and he rarely ever has weekend off, let alone have two days off in a row! Looking forward to hear your hiking adventures! Have a wonderful week! Oh this is so beautiful, fabulous paper and design.